My sister recently purchased her first home, so for Christmas this year I wanted to give her something to decorate her new place. 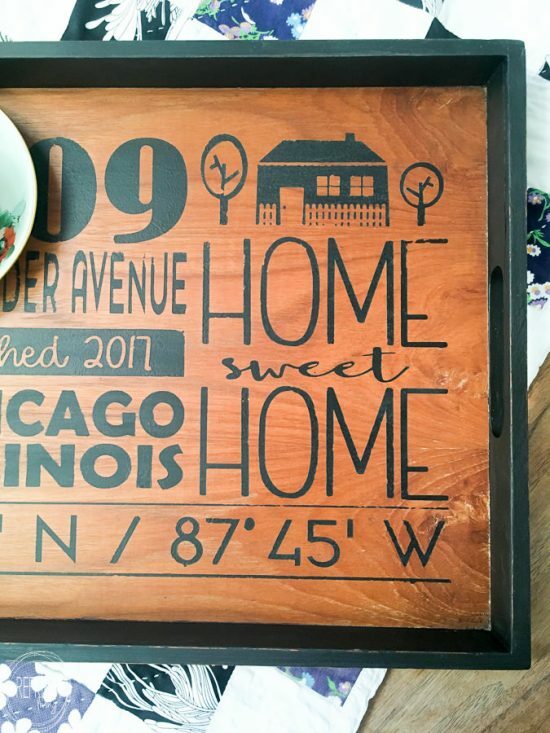 A trusty Pinterest search filled me with tons of inspiration and ideas for new homeowners and led me down the path of wanting to give her something that was personalized with her address. I found quite a few Etsy sellers who make beautiful, customized home address signs and pillows, but I also knew I could make something similar. 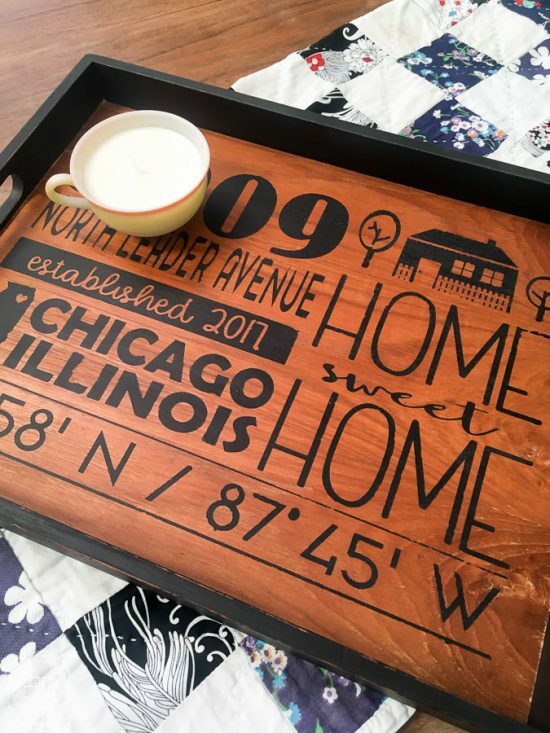 My DIY wheels were turning, which then activated the other half of my brain, the upcycling half, and I combined the personalized address idea with an old wooden tray from the thrift store that was sitting in my basement. 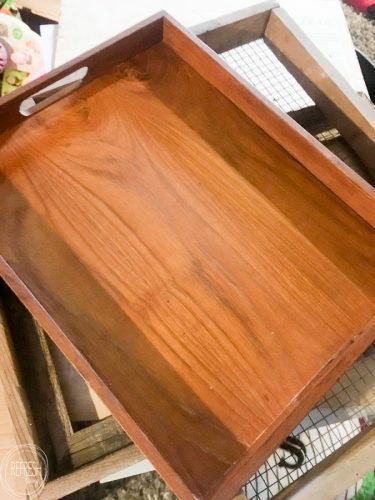 I started by painting the frame of the tray with black paint. The wood on the inside was still in decent shape, so I decided to keep that in tact, and just paint the lettering right over the top of the wood. For the lettering, I made a stencil using my Silhouette cutter. Now, if you don’t have a cutting machine of your own, don’t click off this post just yet! 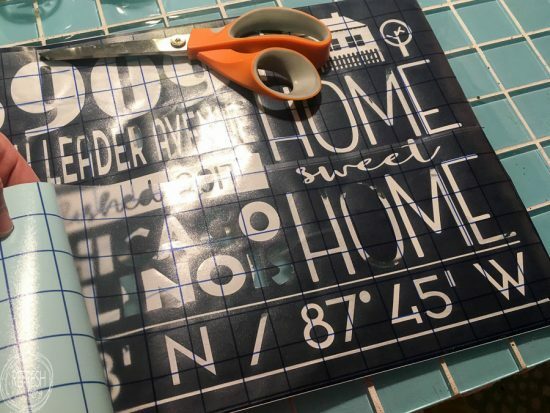 You could just as easily make this design without a stencil! 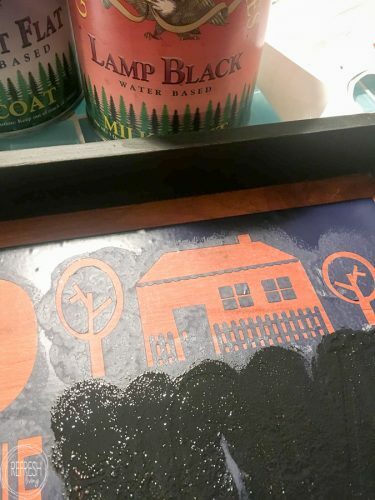 First, I’ll share with you the process for stenciling, then I’ll describe how I would create it if I didn’t have a machine to make my stencil. 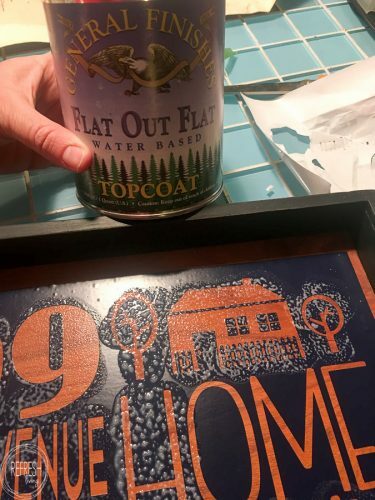 After I removed the interior of my stencil, I stuck transfer tape to the top of it, removed the back of the vinyl and then stuck the vinyl to the tray. My trick for getting clean lines when using stencils is to paint the first layer with clear acrylic paint. This allows the clear to seep under any little bubbles or ridges, and when you paint over it with your color, that paint won’t seep out. Don’t remove the stencil after this step. It’ll be impossible to stick back down in the right place. After the clear layer dried, I painted with black acrylic paint. It’s SO hard to wait for the paint to dry before removing your stencil, but I would recommend doing so, because if you peel it off when it’s wet, I find pieces of the stencil often drag through the fresh paint, which is beyond frustrating. This technique may take a bit more time, but you’ll still end up with the same results in the end – a beautiful, custom painted design! First, you’ll want to design your image and lettering. I recommend PicMonkey – it’s my favorite online graphic design tool and is super easy to use. It’s free for the basic features, or you can purchase a monthly or yearly subscription as well. If you want a crash course on how to use the features in PicMonkey to design, you can check out the first half of this post. After you’ve created your design, you’ll need to print it in the correct size to match your project. If you need it to fit on a size of normal paper, it’s super easy. You can just open the image you created and print it, adjusting the size of the picture to print on a full page. If you need a larger image, you’ll need to stretch your image to fit across multiple pages. I use the Paint program (which most PCs already have), and I’ve explained my steps on how to print an image across multiple pages in this video. I used 220 grit sandpaper to distress the lettering and edges slightly and then sealed it with Flat Out Flat acrylic topcoat. If it wasn’t for the stupid vinyl this project would have been super easy. 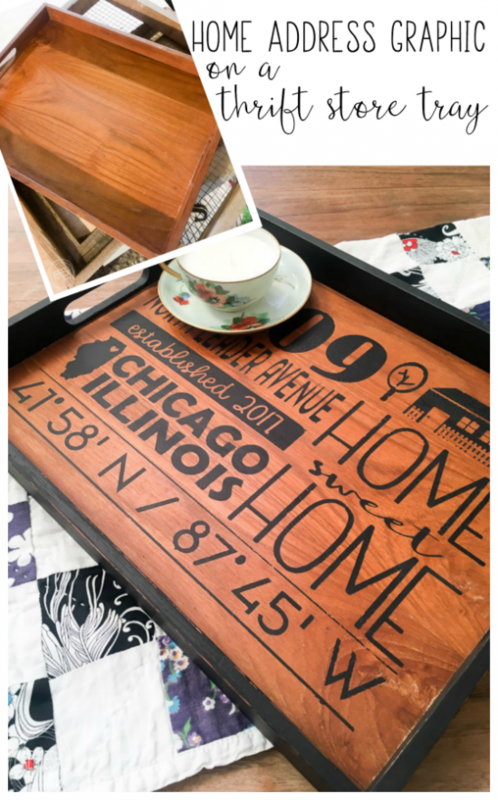 I’m thinking I might need to keep my eye out at the thrift store and estate sales from now on for a tray that I can upcycle for our home! What a FANTASTIC idea to use clear acrylic paint first before using the colored paint on a stencil. I’ve heard of something similar with ModPodge but have yet to try it. 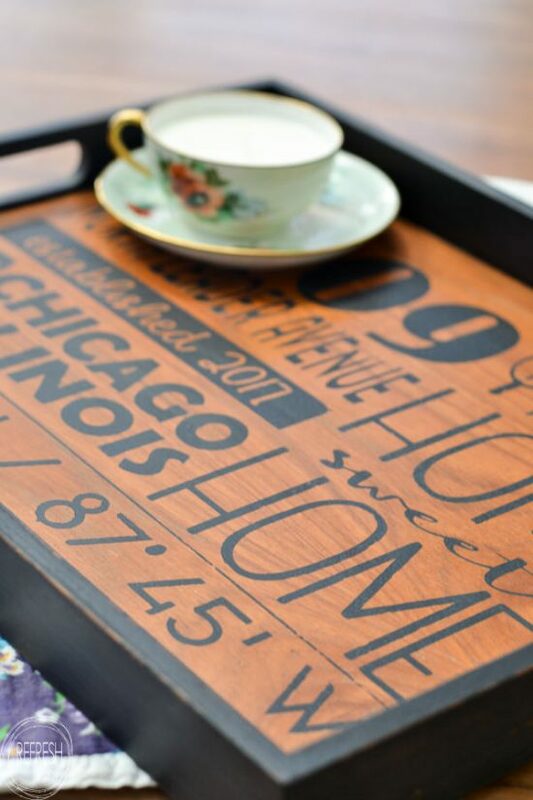 Your stenciled tray is amazing and I bet the new homeowners appreciate a personal gift. How’d you get the stencil in one sheet? I have the Cricut. Would I need to make two separate project, slice it so it’ll print?